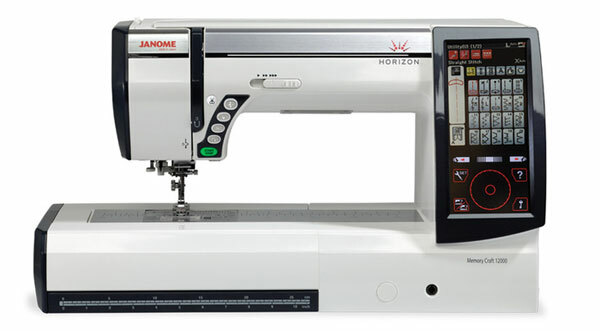 Brand New Janome Machines Coming Late October! • Huge trade-in offers on any old machine. • Introductory bonus pack valued at over $2500. • We believe it’s the best quilting, embroidery and sewing machine on the market. • We’re confident you’ll think it’s the easiest to use machine of its type ever made. We will keep you up-to-date with the latest news regarding these two fantastic machines here on our blog and website. Or speak to one of our friendly staff at your local Hobbysew store for more information. You’ll get plenty of hints and tips about how to create a beautiful home and garden out at the Better Homes and Gardens LIVE show this weekend at Sydney Showground. Hobbysew will be there with bells on. Come and see us at Stand D207. We’ve assisted with workshops too so here’s a tip: if you get in early, you’ll be able to attend one of the free make-and-take sessions with Julia Matthews the Craft Editor on the magazine or Tara Dennis the presenter on the tv show. Dora Papas the Deputy Editor and talented allrounder and Kitiya Palaskas (also very talented!) are presenting too so there’s plenty to take in. And you’ll go home with something brilliant that you’ve made yourself! Take a look here for the timetable of workshops and plan your day accordingly!! Congratulations to Rosemary Walker! 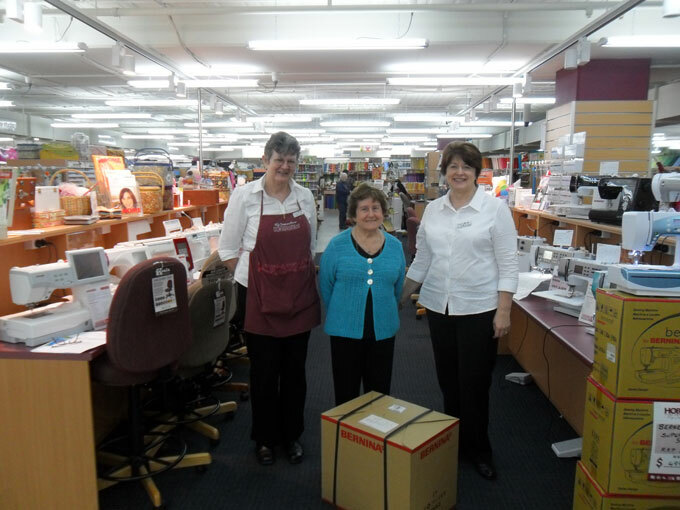 Winner of the Bernina Competition, collecting her brand new machine at Hobbysew Top Ryde City. We’re very excited about the upcoming show – the live event where Better Homes and Gardens magazine and tv show come to life. Hobbysew will be there with a fabulous array of all the sewing and craft products that make creating beautiful things for your home a breeze. Come and watch demonstrations, be part of the make and takes at the Better Craft Ideas Workshop and meet the personalities behind the magazine and tv show. There’s so much to see and do! So make sure you come up to the Hobbysew stand and say hello! Take a look here to see how to buy your tickets. You’ll make terrific savings if you buy before the day. ‘I wanted to make it entirely out of the thread. 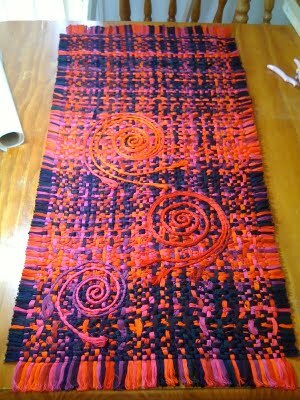 My idea was to create a fabric from the thread by weaving it together. 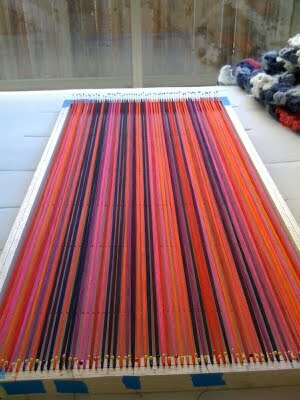 Simple enough except I had no loom, and I decided I wanted it to look chunky – so each ‘strand’ is made up of 50 strands of thread in a continuous loop. Making these alone took hours and hours! To hold it all together while building it, I made a balsa wood frame. 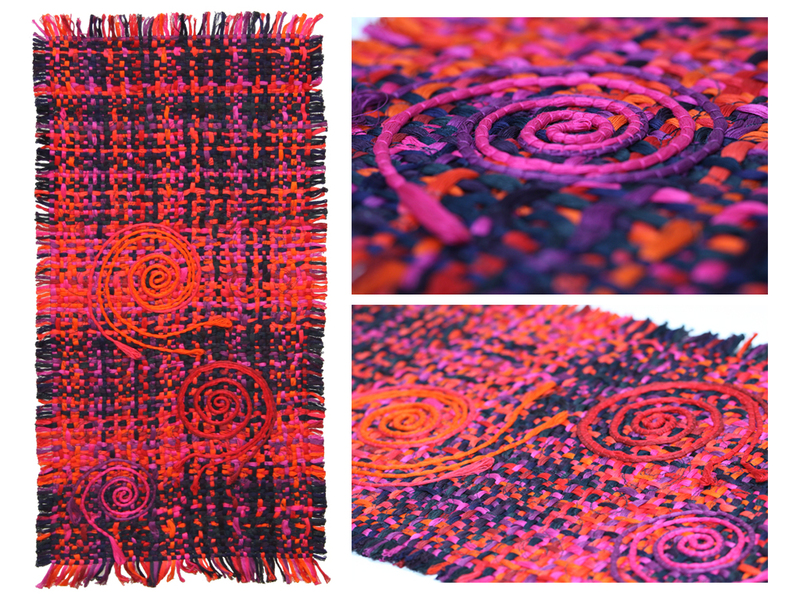 ‘For the colour scheme I was in a bright pinks, reds and oranges mind, no actually I wanted bright vibrant colours that would really sing against the almost blacks and these were the ones that spoke to me. 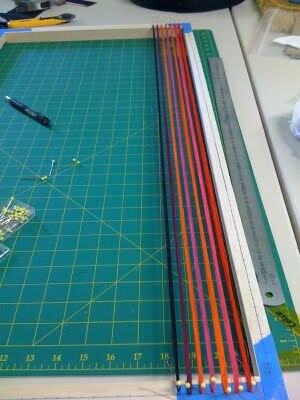 I ended up with about 80 warp threads. 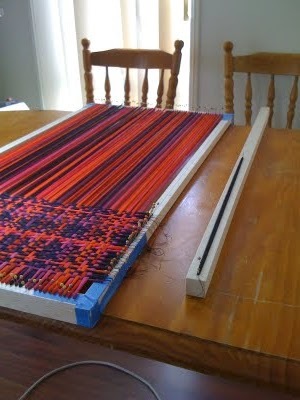 ‘This photo (below) shows the beginnings of the weft threads. 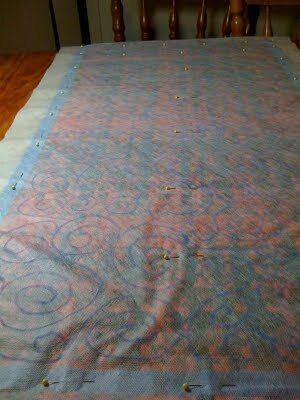 These each took a lot longer to do than the warp as, although they were shorter, I had to carefully weave them through. To hold the thread together I looped the leading end through a binding hem/hair clip. It worked really well, and of course, more cheap pins to hold them in place at either side. ‘The single piece of balsa wood beside the frame is what I used to wrap the threads on (two nails at appropriate spacings). It was the easiest and simplest method I could think of – but my shoulder did get sore. 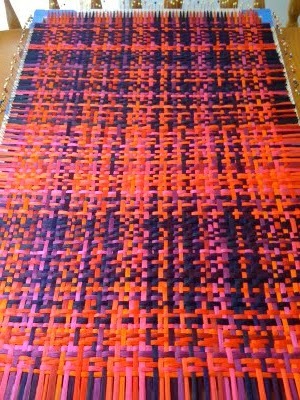 ‘The weaving was almost complete, a few more rows to go. In the end…it was like a uni project where every last hour counted right down to mailing day. ‘Next I used blue painters’ tape to stop the edges from getting all messy, then put a layer of dissoluble stabiliser on both sides. I also made up half of the black hanging sleeve and pinned this in place so it got ‘quilted’ to the piece. You might be able to see the swirls I drew on the stabiliser? These were continuous and done in an almost blue/black thread. 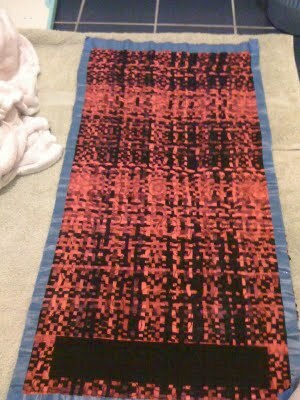 ‘This is the weave after it has been ‘quilted’ and dissolved in the bath…it then got to dry overnight on a bed of towels. I need to add that I finished this bit at 9.30pm and it had to happen that night for drying time. This was Tuesday night and mailing was Thursday for a Friday deadline. At the bottom of the pic is the attached part of the hanging sleeve. And finally, the finished product with the raised swirls completed and the tape just removed. We’re pleased to announce the winners of the Mettler Silk-Finish Competition. First Prize goes to (drum roll, please!) 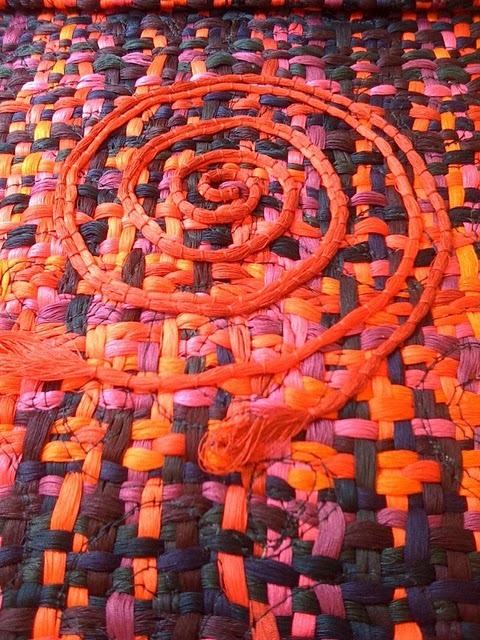 Katherine Chu of Carindale in Queensland for her absolutely stunning ‘Threaded Sunset’ which cleverly used the thread to create a unique wall hanging. She didn’t use any fabric, she created the fabric from scratch! For her ingenuity, creativity and workmanship, Katherine wins a kitchenware package valued at $3452 and she is very excited. Here is the entry to admire. We’ll post more on the method with some step-by-step shots in the coming days. 2nd Prize was awarded to Tracey Atkin of Charmhaven in New South Wales who digitised an image to create “Yumi in Pink’ in Mettler Silk-Finish. 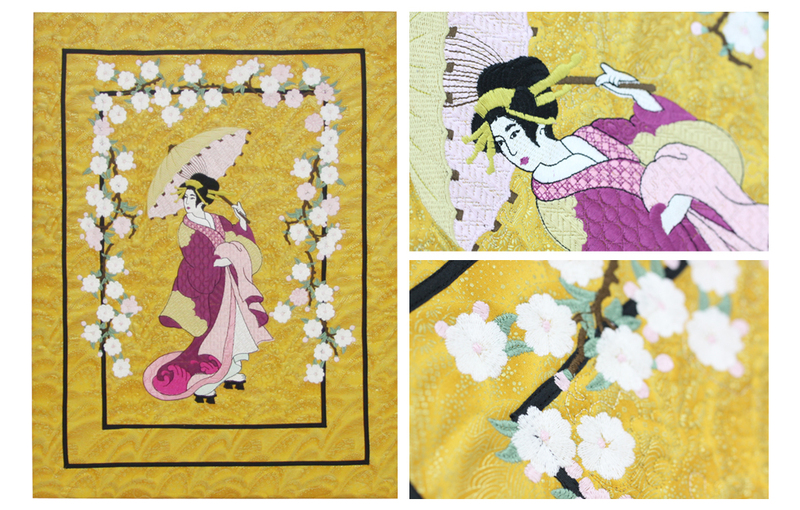 The oriental theme is beautifully executed using a variety of colours and textures. And 3rd Prize goes to Bridget Fletcher of Greendale in Victoria for a beautifully designed ‘Green Man’. There’s so much to look at in this piece, not the least of which is the thread and fabric combinations. Thankyou to everyone who entered and make sure to start working on an entry for the next competition! 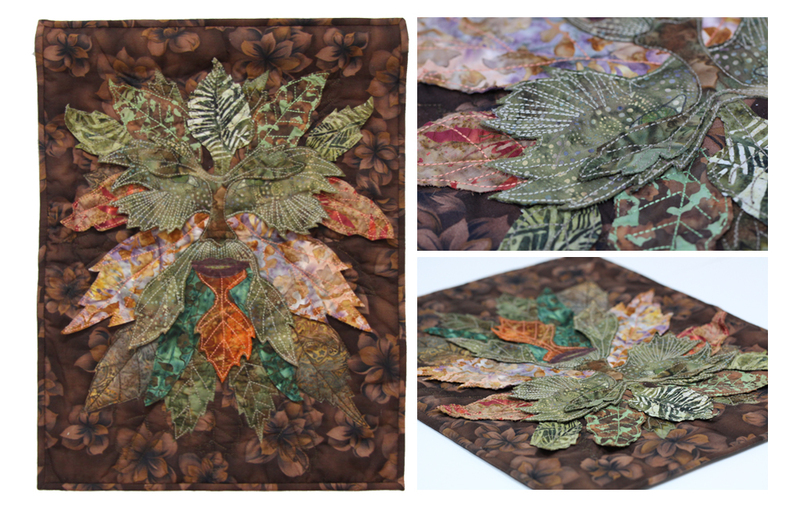 In the next post, we’ll tell you exactly how Katherine made her winning piece. 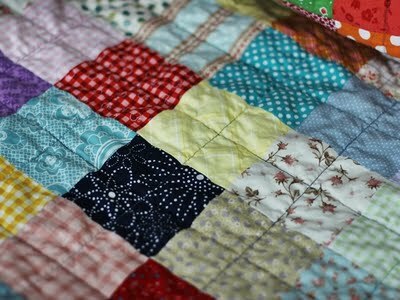 Here is some lovely patchwork from a creative blogger in the U.S. Audrie was brought up in Singapore and Australia but now resides in America. She loves old-fashioned things, sells her handwork on Etsy and writes about it for all of us to enjoy. 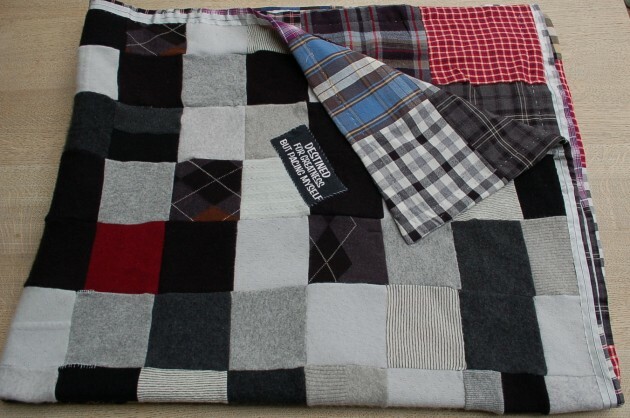 This commissioned quilt is a great one for using up scraps. We all love that! 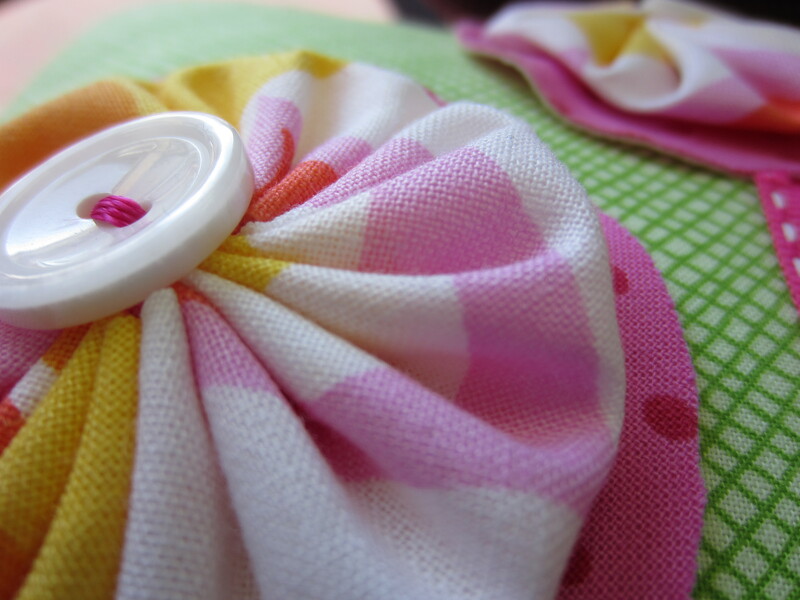 Have you been hanging onto clothes or fabrics only because you can’t bear to part with them? Well, you might find there is a better way to hang onto the memories than have them tucked away in a cupboard. 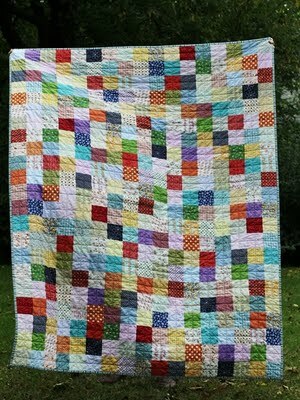 Take inspiration from the story here of a mother who used the clothes her boys had grown out of to make a 21st birthday quilt. She washed the jumpers on hot so they felted up, then cut them into 5 inch squares (13cm roughly). The backing was made from flannelette lumberjack shirts so it will have a lovely softness on the underside. 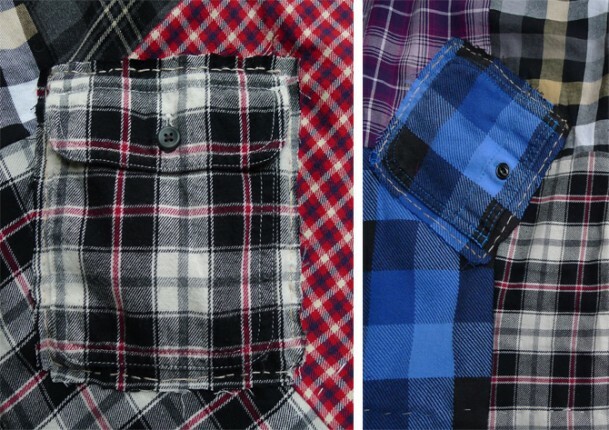 Graphics from the old t-shirts were included and a few pockets hand-stitched in place. 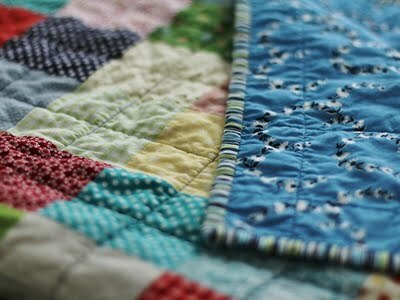 As you can see, the maker is not just being modest when she describes the quilt as ‘homemade’. It does have some raw edges and not-quite-perfect stitches, but all up it has the handmade look of a project lovingly completed. And it’s a great keepsake for a boy about to leave home and go to college. Got any projects you’d like to tell us about?